Despite recent forays onto the North American concert stage under the leadership of guitarist Djelima Dytounkara, the Super Rail Band's seminal role in the development of modern Malian music is today largely forgotten. They may be credited as an early launchpad for the careers of Salif Keita and Mory Kante, but their importance is deeper than that: as the first high-profile Malian band to translate traditional Manding kora and balafon music into a modern urban context, they kick-started the emergence of electric griot music throughout Mali, Guinea and Senegambia. Formed in 1970, the Super Rail Band was the first group to receive sponsorship from the Malian government, who, keen to nurture local culture, bought most of the band's imported Western instruments and underwrote their wages. Throughout the 1970s the band was resident at the buffet bar of capital city Bamako's Station Hotel, a literal crossroads of West African culture and a fashionable social meeting place as well. 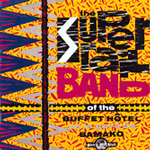 The Super Rail Band was a vital stepping-stone for Keita and Kante, and also for Kante Manfila, originally an acoustic guitarist, who later became a key figure in the development of local electric music. In 1973, Keita and Manfila left to join Les Ambassadeurs in the Cote d'Ivoire, and Kante departed not long after to develop the kora into a modern lead instrument in front of an all-electric band. The age of the electric griot was born. Recorded in late 1982 and first released in the UK in 1985 as New Dimensions In Rail Culture, this reissue puts a vital piece of the electric griot jigsaw back on the decks. The Manding modern/traditional blend is maturing but is not yet wholly integrated, and its constituent partsancient balafon and kora music (with kit drums and electric guitars reinterpreting the traditional instruments' lines), Islamic vocal stylings, Ghanaian dance-band highlife (E.T. Mensah had been massively popular in Mali in the 1960s) and, uniquely in the region at the time, Zairean rumbaare each distinctly audible. Sekou Kante and Lanfia Diabate may not be as widely celebrated as their predecessors Keita and Kante, but they are A-list effervescent vocalists, fronting an easy-rocking, locked-down band. The horn players (sadly the sleeve has not acquired full personnel details over the years) are straight out of Accra, barely mutated, and Dytounkara's cascading guitar lines vividly evoke traditional kora and n'goni music while adding new electric textures and impact. The feral beauty of rural Manding folk music is perfectly captured during the second half of "Konowale," electric and bass guitars enjoy some prolonged and enthusiastic coupling on "Tallassa," and tumescent, Franco-ish guitar licks enliven "Mali Yo." A great album then, and a great album still. Track Listing: Foliba; Bediana Mogo; Tallassa; Konowale; Mali Yo. Personnel: Sekou Kante: lead vocals; Lanfia Diabete: lead vocals; Djelima Dytounkara: guitar; undocumented: saxophones, guitars, keyboards, bass guitar, drums, percussion.